A Rush of Blood to the Head is the second studio album by the British alternative rock band Coldplay. Released on 26 August 2002 in the UK through the label Parlophone, the album was produced by the band and British record producer Ken Nelson. Recording started after the band became popular worldwide with the release of their debut album, Parachutes, and one of its singles in particular, "Yellow". The album makes greater use of electric guitar and piano than its predecessor. The album was made available in August 2002, two months after its original planned release date. It was released on 27 August in the United States through Capitol Records. Capitol released a remastered version of the album in 2008 on a 180-gram vinyl record as part of the "From the Capitol Vaults" series. The album debuted and continued their huge commercial legacy, an ongoing pattern that began with Parachutes which made Coldplay one of the best-selling bands worldwide. It topped the UK Albums Chart upon its first week of release in the United Kingdom, and became the eighth biggest-selling album of the 21st century in the UK. The British Phonographic Industry has since certified the album 9× Platinum for its accumulated sales of over 2.8 million units in the UK and this album sold 20 million worldwide. The album spawned the hit singles "In My Place", "The Scientist", and "Clocks". "God Put a Smile upon Your Face" was also released, but was significantly less successful. A Rush of Blood to the Head has been critically acclaimed, and the band won the 2003 Grammy for Best Alternative Album for the second year in a row, and the 2004 Grammy for Record of the Year for the song "Clocks". In 2012 it was ranked number 466 on Rolling Stone's 500 Greatest Albums of All Time. It was also voted the best album of all time by the listeners of BBC Radio 2 in a poll conducted in 2013. The band started recording the album in London a week after the September 11 attacks in the United States, during which their "poignant songs ... garnered larger audiences". Coldplay had never stayed in London for an extended period before and were bombarded by problems focusing on the production process. They decided to relocate to Liverpool, where they had recorded some of the songs on Parachutes. Vocalist Chris Martin said that once there they "became obsessed with recording". "In My Place" was the first song recorded for the album and the one that the band released as the album's lead single "because it was the song that made us want to do a second album. It kept us going and made us think we could still write songs", following "a strange period of not really knowing what we were doing" three months after the success of Parachutes. The band wrote more than twenty songs for the album and some of those, including "In My Place" and "Animals", were performed live during the tours promoting Parachutes. The album's title was revealed through a post on the band's official website. During initial recording sessions in Liverpool, vocalist Chris Martin and guitarist Jonny Buckland worked alone, and only on weekends. Each Monday, they would present the song ideas that they had developed to their bandmates. With A Rush of Blood to the Head nearly completed, Martin went into the studio late one night and wrote a piano riff that he has stated "just came out". The band recognised that this early version of the song, that would become "Clocks", was special the first time Martin played it to them. Reasoning that it was too late to include the song on the album, they recorded a demo version and included it on a CD marked "Songs for #3", featuring unfinished tracks they intended to work on for their third studio album. By June 2002, the band had completed A Rush of Blood to the Head, but thought their output sounded "rubbish" and reached an agreement with the label to postpone the release of the album until they were completely satisfied. Subsequently, many songs were discarded because they sounded like they could have been on Parachutes. Martin has claimed that it would have been uninteresting: "It would have shown that we're happy to sit back on what we'd done, and we're not. For us, it was important to progress and try to improve upon our abilities as musicians." Such ambitions put the band under strain: "sometimes practice sessions ended abruptly with one or more members of Coldplay threatening to quit". After headlining the 2002 Glastonbury Festival, Coldplay returned to the studio and worked on some tracks from the "Songs for #3" CD they had produced earlier. Phil Harvey, the band's manager, heard "Clocks" and urged them to rework it immediately: "No, you must do that song now 'cause you're going on [in the lyrics] about urgency, and you're talking about keeping this song back. That doesn't make sense." The music for "Clocks" is mainly built around a piano riff. Recording the album after 11 September attacks gave the band a fresh perspective: "The new songs are reflective of new attitudes. [They tell listeners] not to be frightened. Anybody can achieve whatever they want to." Most of the song lyrics are about urgency. Martin has commented that previous songs were more relaxed since they were in a comfortable state of mind: "Perhaps there's a bit more urgency on some of these songs. And that's born from all the places we've been and the things we've experienced." Martin has explained, in relation to the theme of urgency, that the album's title means "doing something on impulse". Several songs on the album are about relationships. These tracks are based on reality, but according to Martin, they were written with a fictional twist: "Songs are like fairy tales: they have a beginning and an end and you can make it all work perfectly. Real life doesn't work like that". The album includes ballads and acoustic songs featuring extensive use of guitar and piano. The U2-esque "epic rock" of the album's opening track "Politik", the piano-driven "Clocks", the loud guitars of "A Whisper" and the Crowded House-inspired guitar in "Warning Sign" were seen as an extension of the band's musical range. Chris Martin has stated that the album's title track is an homage to American singer-songwriter Johnny Cash, whom he considered one of "the greatest ... men with just guitars". The song "Green Eyes" was written by Chris Martin for two people: an "American friend" and bandmate, Jonny Buckland. The album cover for A Rush of Blood to the Head was designed by photographer Sølve Sundsbø. Sundsbø had been hired by fashion magazine Dazed & Confused in the late 1990s to produce something with a "technological feel, something all white". As an artist, he tried to do "stuff that hasn't been done before, which is virtually impossible"; he suggested taking shots using a three-dimensional scanning machine. The model for the shot wore an all-white makeup because it produces the "best results"; for the image, the model wore a twill-coloured cape. The computer could not read the colours so it was replaced with spikes, and the head in the image was chopped because the machine only scanned 30 centimetres. The editor of the magazine liked the image and eventually featured it in one of their publications. Martin saw the image in the magazine and approached Sundsbø for permission to use the image as the cover of A Rush of Blood to the Head. For the album's singles, Martin asked Sundsbø what he could do; the latter suggested scanning the head of each member of the band (Sundsbø also did artwork duties for the Live 2003 home video). The booklet contains only two photos; One with Coldplay in a location that was rumoured to be a forest, and one with the same band in the studio. The album cover was among the ten chosen by the Royal Mail for a set of "Classic Album Cover" postage stamps issued in January 2010. Upon release, A Rush of Blood to the Head received generally favorable reviews from contemporary critics. Review aggregating website Metacritic reports a normalised score of 80 based on 25 reviews. Many felt that it built upon their previous album, Parachutes. Alexis Petridis of the newspaper The Guardian wrote that the band's "new assurance is everywhere ... the timidity of Parachutes is nowhere to be found". He concludes, "It sounds like an album ready to take on the world, and win." Kelefa Sanneh of The New York Times praised the album, commenting that it is "one of the year's best albums" and describing it as "sparser, stranger and even catchier than its predecessor". Rolling Stone magazine's Rob Sheffield, said that "A Rush of Blood to the Head is a nervier, edgier, thoroughly surprising album", adding, "where Parachutes was the clumsy diary of a high-strung kid, A Rush of Blood sounds more like a band with the confidence to test its own limits." Ted Kessler of NME lauded the album, calling it "an album of outstanding natural beauty, an organic, wholesome work." MacKenzie Wilson of AllMusic echoed the above comments, saying that it is a "strong album". Wilson, who compliments Martin for his "sharpened" falsetto and refined "haunting delivery" and Buckland for his "riveting guitar work", notes that "regardless of the band still being in their mid-twenties, they've made an amazing record". Emma Pearse of the American newspaper The Village Voice has the same sentiments, stating that it is "a little edgier, trancier, and more conversational" compared to Parachutes. Robert Christgau gave the album a one-star honourable mention ( ) and quipped, "Let Green Eyes dump him for real and we'll see how long he hums in the void." A Rush of Blood to the Head has earned the band several awards from both the domestic and international music press. In 2002 it was awarded Best Album at the Q Awards. In the same year, the band won two Grammy Awards: Best Alternative Music Album and Best Rock Performance by a Duo or Group with Vocal for the song "In My Place". In 2003 A Rush of Blood to the Head won Best British Album at the BRIT Awards, and the following year the band earned their first Grammy Award for Record of the Year for the song "Clocks" for a total of 3 Grammys for this album. The band won 3 VMAs at the 2003 MTV Video Music Awards for Best Group Video, Breakthrough Video and Best Direction in a Video for "The Scientist" and its music video on YouTube has over 90 million views. The same year, they won the awards best NME album of the year, and best album of the year at the NME awards. The album was chosen in 2002 as Billboard magazine's Critics' Choice. Kludge included it on their list of best albums of 2002. In 2012, it was ranked number 466 on Rolling Stone magazine's list of the 500 greatest albums of all time. It was also ranked 21st on Rolling Stone's list of top 100 albums of the 2000s. In 2007 The National Association of Recording Merchandisers and the Rock and Roll Hall of Fame released a list of what they term "The Definitive 200 Albums of All Time"; A Rush of Blood to the Head ranks at number 65 on the list. The album was nominated for the BRITs Album of 30 Years at the 2010 BRIT Awards. In a BBC Radio poll in 2013, the album topped the list ahead of Hopes and Fears by Keane, Rio by Duran Duran and The Dark Side of the Moon by Pink Floyd. Coldplay promoted A Rush of Blood to the Head with a tour of the same name. A Rush of Blood to the Head made an entrance into the UK Albums Chart upon its debut week, entering at number 1 and moving 273,924 copies. The British Phonographic Industry has since certified the album eight times platinum for its accumulated sales of over 2.4 million copies. With the subsequent release of "Clocks" and "The Scientist", the album spent over one year on the chart. A Rush of Blood to the Head has been placed at number seven on the list of United Kingdom's 20 biggest-selling albums of the 21st century, published by the British trade paper Music Week. In July 2011, A Rush of Blood to the Head climbed from No. 176 back to No. 44 in the album's 250th charting week there. As of May 2014, the album had sold 2,875,980 copies in the UK, making it Coldplay's best-selling album. As of March 2015, it is the tenth best-selling album of the 21st century. 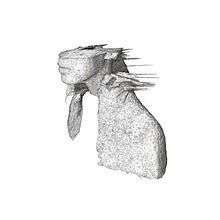 In the United States, A Rush of Blood was Coldplay's first venture into the top 5 with 144,000 copies sold initially, stronger than its predecessor, Parachutes, which debuted at number 189 in December 2000. It has since been certified four times platinum by the Recording Industry Association of America, and it has sold sales 4,925,000 copies as of July 2014. It has been certified seven times platinum by the Australian Recording Industry Association, having accumulated shipments of over 490,000 units, and four times platinum by the Canadian Recording Industry Association for shipments of over 400,000. All tracks written by Chris Martin, Jonny Buckland, Guy Berryman, and Will Champion. ↑ "Parachutes: Coldplay". Billboard. Retrieved 14 September 2008. 1 2 3 4 Moss, Corey; Cornell, Jeff (18 December 2001). "Coldplay Ready Second Album As 'Trouble' Heats Up". MTV. Retrieved 3 September 2008. 1 2 3 4 Webb, Robert (25 July 2008). "Story of the Song: 'Clocks', Coldplay (2002)". The Independent. London. Retrieved 16 September 2008. ↑ Alan Jones (2011). "Adele still on top but UK album sales fall to 13-year low". Music Week. Retrieved 25 August 2011. 1 2 "Coldplay tops BBC favourite albums poll". 3 News NZ. 2 April 2013. 1 2 3 4 5 Cumberbatch, Franklin (13 August 2002). "Coldplay: Going Out of My Head". VH1. Archived from the original on 16 September 2008. Retrieved 14 September 2008. ↑ Nelson, Chris (12 February 2001). "Coldplay Warm Up on U.S. Tour Opener". MTV. Retrieved 14 September 2008. ↑ Luerssen, John D. (25 April 2002). "Coldplay Sets Album Title, June Gigs". Billboard. Retrieved 14 September 2008. 1 2 3 Wiederhorn, Jon (2 February 2004). "Road to the Grammys: The Making Of Coldplay's 'Clocks'". MTV. Retrieved 16 September 2008. 1 2 Wiederhorn, Jon (27 August 2002). "Coldplay Bleed For Beauty on a Rush of Blood to the Head". MTV. Retrieved 16 September 2008. ↑ "Coldplay – A Rush of Blood to the Head". BBC Music. 26 August 2002. Archived from the original on 2003-01-03. Retrieved 2 October 2008. ↑ Orshoski, Wes (16 August 2002). "Cash 'Comes Around' On New 'American' Album". Billboard. Retrieved 15 September 2008. ↑ The Oracle (18 December 2008). "The Oracle: "December 18, 2008". Coldplay.com: The Oracle. London. Archived from the original on 17 February 2012. Retrieved 20 February 2012. 1 2 Benedictus, Leo (14 February 2008). "Sølve Sundsbø's best shot". The Guardian. London. Archived from the original on 2 October 2008. Retrieved 10 September 2008. ↑ (2002) Artwork for A Rush of Blood to the Head by Coldplay. Capitol (CDP 7243 5 40504 2 8). ↑ "Classic Album Covers: Issue Date – 7 January 2010". Royal Mail. Retrieved 8 January 2010. ↑ Michaels, Sean (8 January 2010). "Coldplay album gets stamp of approval from Royal Mail". The Guardian. London. Archived from the original on 11 January 2010. Retrieved 8 January 2010. 1 2 "Reviews for A Rush of Blood to the Head by Coldplay". Metacritic. Retrieved 1 December 2011. 1 2 Wilson, MacKenzie. "A Rush of Blood to the Head – Coldplay". AllMusic. Retrieved 16 September 2008. ↑ Maconie, Stuart (September 2002). "Coldplay: A Rush of Blood to the Head". Blender (9): 145. Archived from the original on 7 May 2004. Retrieved 6 July 2016. ↑ Browne, David (2 September 2002). "A Rush of Blood to the Head". Entertainment Weekly. Retrieved 8 September 2009. 1 2 Petridis, Alexis (16 August 2002). "Coldplay: A Rush of Blood to the Head". The Guardian. London. Retrieved 16 September 2008. ↑ Kessler, Ted (22 August 2002). "Coldplay: A Rush of Blood to the Head". NME. Retrieved 1 December 2011. ↑ Tangari, Joe (8 September 2002). "Coldplay: A Rush of Blood to the Head". Pitchfork Media. Retrieved 22 October 2011. ↑ Lynskey, Dorian (September 2002). "Coldplay: A Rush of Blood to the Head". Q (194): 198–99. 1 2 Sheffield, Rob (26 August 2002). "A Rush Of Blood To The Head". Rolling Stone. Retrieved 8 September 2009. ↑ Walters, Barry (September 2002). "The Chilling Effect". Spin. 18 (9): 125–26. Retrieved 8 September 2009. ↑ "Coldplay: A Rush of Blood to the Head". Uncut (64): 116. September 2002. ↑ "Coldplay: A Rush of Blood to the Head (2002): Reviews". Metacritic. Retrieved 10 April 2012. ↑ Sanneh, Kelefa (14 August 2002). "POP REVIEW; Vertigo From the Falsetto and 'Parachutes'". The New York Times. Retrieved 15 September 2008. ↑ Pearse, Emma (17 September 2002). "New Shapes and Colors". The Village Voice. Archived from the original on 16 December 2004. Retrieved 16 September 2008. ↑ Christgau, Robert. "CG: Coldplay". RobertChristgau.com. Retrieved 21 May 2012. ↑ "Q Awards 2002: Winners". BBC. 14 October 2002. Retrieved 15 September 2008. 1 2 "Grammy Awards Winners". The Recording Academy. Archived from the original on 17 December 2008. Retrieved 11 September 2012. ↑ "Brit Awards 2003: Winners". BBC. 21 February 2003. Retrieved 15 September 2008. ↑ "Coldplay's 'Blood' Is Billboard's Critics' Choice". Billboard. 20 December 2002. Retrieved 15 September 2008. ↑ "The Best of 2002". Kludge. Archived from the original on 22 July 2004. Retrieved November 25, 2015. ↑ "The RS 500 Greatest Albums of All Time". Rolling Stone. 18 November 2003. p. 5. Archived from the original on 13 September 2008. Retrieved 15 September 2008. ↑ "Coldplay, 'A Rush of Blood to the Head'". Rolling Stone. Jann S. Wenner. Archived from the original on 2011-07-22. Retrieved 1 September 2011. ↑ "Definitive 200". The Rock and Roll Hall of Fame and Museum. Archived from the original on 27 September 2008. Retrieved 15 September 2008. 1 2 Jones, Alan (12 March 2008). "The 20 biggest selling albums of the 21st Century". Music Week. Archived from the original on 25 September 2008. Retrieved 15 September 2008. ↑ "Certified awards". British Phonographic Industry. Archived from the original on 7 October 2008. Retrieved 15 September 2008. ↑ "Album Top 40 from the Official Charts Company". Official Charts Company. Archived from the original on 17 July 2011. Retrieved 10 August 2011. 1 2 Jones, Alan (26 May 2014). "Official Charts Analysis: Coldplay LP sells 168k to set 2014 pace". Music Week. Intent Media. Retrieved 14 November 2015. (subscription required (help)). ↑ Moss, Liv (19 March 2015). "Official Biggest Selling Albums of the Millennium so far revealed!". Official Charts Company. Retrieved 26 January 2016. ↑ Todd, Martens; Ellis, Michael (5 September 2002). "Dixie Chicks Make Their 'Home' On Top". Billboard. Retrieved 15 September 2008. 1 2 Grein, Paul (8 July 2014). "USA: Top 20 New Acts Since 2000". Yahoo! Music. ↑ "ARIA Charts – Accreditations – 2004 Albums". Australian Recording Industry Association. Archived from the original on 7 August 2008. Retrieved 15 September 2008. ↑ "Gold & Platinum Certification". Canadian Recording Industry Association. November 2003. Archived from the original on 6 October 2008. Retrieved 15 September 2008. 1 2 3 4 5 6 7 "Australiancharts.com – Coldplay – A Rush of Blood to the Head". Hung Medien. Retrieved 25 November 2010. ↑ "Balanço Semestral das Vendas Mundiais" (in Portuguese). Associação Brasileira dos Produtores de Discos. December 2005. Retrieved 4 August 2009. ↑ Steffen Hung (6 March 2009). "Dutch Albums Chart". Dutchcharts.nl. Archived from the original on 8 February 2010. Retrieved 31 December 2009. ↑ "Hits of the World – Eurochart". Billboard. Nielsen Business Media, Inc. 14 September 2002. p. 69. Retrieved 27 June 2012. ↑ musicline.de / PhonoNet GmbH. "German Albums Chart". Musicline.de. Retrieved 25 November 2010. ↑ "Ελληνικό Chart". Web.archive.org. 3 March 2005. Archived from the original on 3 March 2005. Retrieved 25 November 2010. ↑ "Irish Music Charts Archive – Top 75 Artist Albums, Week Ending 5 September 2002". Chart-track.co.uk. Retrieved 27 June 2012. ↑ "Mexican Charts – Coldplay – A Rush of Blood to the Head (album)". Mexicancharts.com. Hung Medien. Archived from the original on 2012-10-22. Retrieved 27 June 2012. ↑ "norwegiancharts.com - COLDPLAY - A RUSH OF BLOOD TO THE HEAD (ALBUM)". Retrieved 11 August 2016. ↑ "23 września 2002 – Sprzedaż w okresie 09.09.2002 – 15.09.2002" (in Polish). OLiS. Retrieved 27 June 2012. ↑ "Hits of the World – Portugal". Billboard. 5 October 2002. p. 63. Retrieved 27 June 2012. ↑ "Hits of the World – Spain". Billboard. 14 September 2002. p. 68. Retrieved 27 June 2012. ↑ Steffen Hung (25 December 2009). "Swedish Albums Chart". Swedishcharts.com. Archived from the original on 3 January 2010. Retrieved 31 December 2009. ↑ Steffen Hung. "Swiss Albums Chart". Hitparade.ch. Archived from the original on 1 March 2010. Retrieved 31 December 2009. ↑ "UK Albums Chart". Theofficialcharts.com. Archived from the original on 2 November 2008. Retrieved 25 November 2010. ↑ "Billboard 200". Billboard. Archived from the original on 6 January 2010. Retrieved 31 December 2009. ↑ "Discos de Oro y Platino – Coldplay" (in Spanish). Cámara Argentina de Productores de Fonogramas y Videogramas. Archived from the original on 16 June 2009. ↑ "ARIA Charts – Accreditations – 2012 Albums". Australian Recording Industry Association. Retrieved 28 June 2012. ↑ "Brazilian album certifications – Coldplay – A Rush of Blood" (in Portuguese). Associação Brasileira dos Produtores de Discos. Retrieved 28 June 2012. ↑ "Canadian album certifications – Coldplay – A Rush of Blood". Music Canada. Retrieved 28 June 2012. 1 2 "Coldplay" (in Finnish). Musiikkituottajat – IFPI Finland. Retrieved 28 June 2012. ↑ "French album certifications – Coldplay – A Rush of Blood" (in French). Syndicat National de l'Édition Phonographique. Retrieved 28 June 2012. ↑ "Gold-/Platin-Datenbank (Coldplay; 'A Rush of Blood')" (in German). Bundesverband Musikindustrie. Retrieved 28 June 2012. ↑ "Greek album certifications – Coldplay – A Rush of Blood" (in Greek). IFPI Greece. Retrieved 28 June 2012. 1 2 "Coldplay in tour, come un tornado". Il Piccolo (in Italian). 23 April 2003. p. 21. Archived from the original on 28 June 2012. Retrieved 28 June 2012. ↑ "Certificaciones – Coldplay" (in Spanish). Asociación Mexicana de Productores de Fonogramas y Videogramas. Archived from the original on 26 April 2008. Retrieved 28 June 2012. ↑ "Buzz-top-3: Chirac, Donner en Coldplay". HP/De Tijd (in Dutch). 16 December 2011. Archived from the original on 30 June 2012. Retrieved 30 June 2012. ↑ "The Official New Zealand Charts – Chart #1383 – Sunday 9 November 2003 – Top 50 Albums Chart". Recording Industry Association of New Zealand. Archived from the original on 28 June 2012. Retrieved 28 June 2012. ↑ "Spanish album certifications – Coldplay – A Rush of Blood" (PDF) (in Spanish). Productores de Música de España. Retrieved 28 June 2012. Select the "Chart", enter ' in the field "Year". Select ' in the field "Semana". Click on "Search Charts"
↑ "Guld- och Platinacertifikat − År 2003" (PDF) (in Swedish). IFPI Sweden. Retrieved 28 June 2012. ↑ "The Official Swiss Charts and Music Community: Awards (Coldplay; 'A Rush of Blood')". IFPI Switzerland. Hung Medien. Retrieved 28 June 2012. ↑ "IFPI Platinum Europe Awards – 2011". International Federation of the Phonographic Industry. Retrieved 28 June 2012. Roach, Martin (2003). Coldplay: Nobody Said it was Easy. Omnibus Press. ISBN 0-7119-9810-8. Retrieved 14 September 2008.